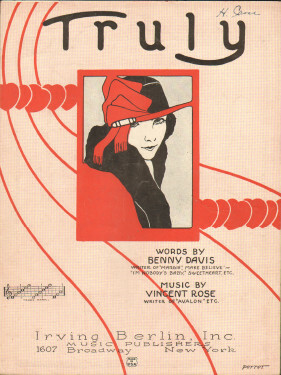 Irving Berlin, Inc. was doing pretty well in 1922, when Benny Davis and Vincent Rose produced this romantic song for the organization. We are happy to offer the original sheet music of Truly for download as a PDF file. The download includes the colorful original cover, and the price is $3.50. Charge it to your credit card or PayPal account. Thanks to the Library of Congress, you can stream a Victor Record recording of this classic. The orchestra (no vocal available) is the fabled Paul Whiteman Orchestra, directed by Paul Whiteman himself, with Clyde Doerr on saxophone, recorded June 23, 1922. Want to try this one out yourself, or, as they said in the day, "Try this on your piano!" Perhaps that old upright piano in your own front parlor? Then, by all means, get the sheet music!